Choosing a worktop can be one of the most stressed components in any kitchen. Not only in design terms, because let’s face it there are so many colours and textures to choose from, throw in which material to go for & your head might be spinning. I’m going to run through a few – Laminate, Wood, Granite, Quartz and Solid surface, they all have their Pro’s & Con’s, but ultimately I would say budget, aesthetics, longevity & practicality are the main areas people consider when it comes to making that decision. Laminate is probably the most wallet friendly option, manufactured from chip board then wrapped in a laminate, available in a wide range of colours often to resemble wood grains & stone worktops. Usually available in two thicknesses 20mm (we would use in modern kitchen designs) & 40mm (in traditional kitchen designs). Around 4000mm in length; width of 600mm & a max of 900mm which is used mainly for islands or large prep areas, they also come with a matching upstand. We use Formica, Duropal & Axiom. Not resistant to steam, heat or chopping. Not compatible with Belfast or undermount sinks. Wood provides a warming element to any décor & has the ability to match any colour scheme thanks to the different stains, grains & tones. Because of the optional thickness your worktop will always be unique. I should point out butcher block is less expensive than full stave or plank. Colour can be manipulated with stain to suit your kitchen design. Needs a lot of maintenance, oiled or treated regularly. Granite comes from igneous rock that never makes it out of the volcano the atoms form into a regular structure, which gives granite it’s impressive strength. It can with stand most scratches & burns however different types may be more or less porous, so they usually require sealing before use to prevent stains (always mop up potential stains just incase). Colours are determined by the minerals & metals present as the stone develops, so different geographical regions will produce stones of varying shades from pale & veined to the deepest, richest black. 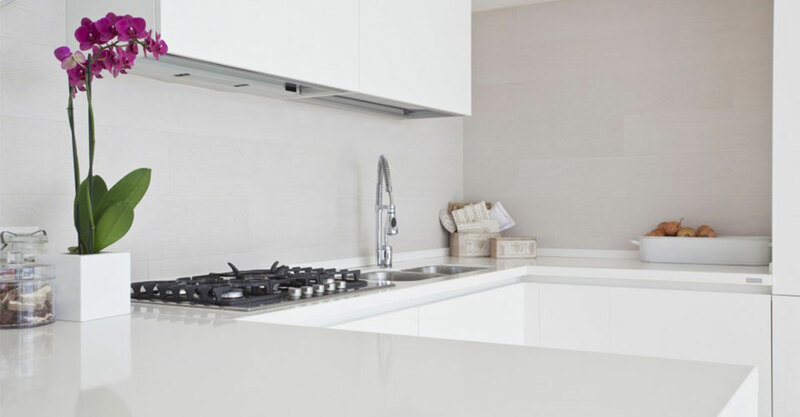 Solid surface is an elegant hygienic solution for the modern day kitchen, being acrylic means this product can be joined seamlessly and fabricated into any shape imaginable. It is 100% non-porous which makes it highly suitable for food prep. Again, this worksurface is available in a range of colours. We use Corian, Staron & Hanex. Although there is that extra cost with Quartz, Granite & Solid surface I would stress that there are different pricing grades, if you would like to spend a little extra on your work surface, call in & view some samples in our showroom. We also have a wide selection of laminate and wood samples. Vale offer a bespoke service to suit every discerning customer. The design team offer a consultation service to discuss your ideas and produce full 3D drawings for your individual style of kitchen.